The PTM Werks Series of children’s picture books is designed to inspire little builders, designers, pilots, and engineers to better understand how the machines all around us work. 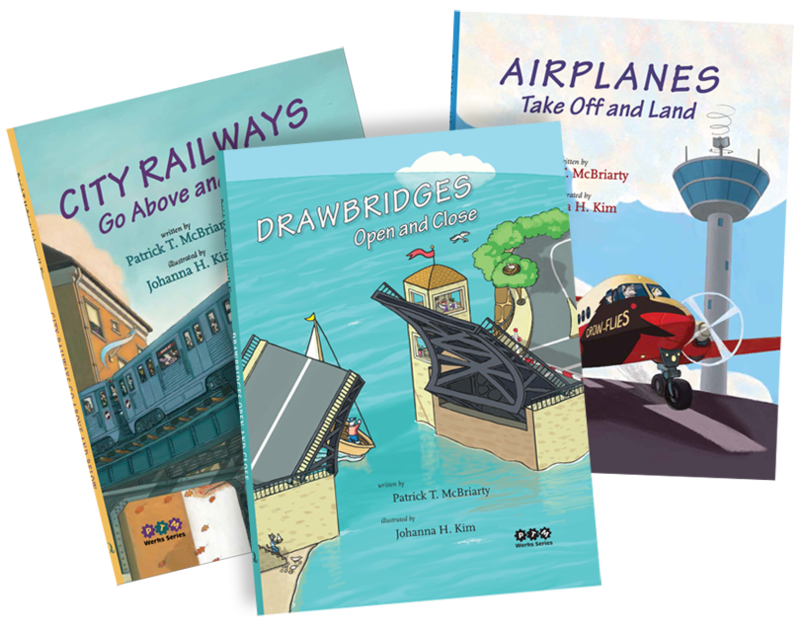 These fun, informative, and approachable children’s books on drawbridges, airplanes, and city railways offer an early childhood introduction to STEM and STEAM topics. Have you ever seen a fox operate a drawbridge, a sheep fly an airplane, or a dog operate a subway train? Although these books are technically fiction they reveal the inner workings and actual behind-the-scenes and step-by-step process of opening and closing a drawbridge, flying a commercial airplane, and operating a subway or elevated train. Get these for your little one today! The PTM Werks Series of children’s picture books explores the machines and basic transportation all around us and taps into a child’s natural curiosity to encourage learning or even a lifetime passions and possible career. Kids and adults, alike, will enjoy reading these books over and over again to discover the multiple layers within. Complex concepts and mechanical elements are distilled so they are easy to grasp and relate basic concepts in a fun, playful manner. Partnering with the talented illustrator Johanna H. Kim, these books present a world of funny and engaging animal characters and fanciful vehicles, water and aircraft to make STEM/STEAM topics interesting and exciting. Explore the busy world of the PTM Werks Series with the little ones in your life. PTM Werks Series can usually be found in the children’s non-fiction or transportation book sections at finer booksellers across the country, Amazon, and Barnes & Noble.com, and are part of the New York, Chicago, Dallas, Seattle, Los Angeles County, and many other public library collections. Ask for these books at your favorite bookseller or local library. Mixing a Richard Scarry-like style with a dash of David Macaulay-esque diagrams the PTM Werks Series is published by CurlyQ Press, an imprint of Applewood Books, and distributed by Ingram (IPS) and Baker & Taylor. ​It is hoped these books will inspire children to explore, create, and pursue their dreams.